Picture the scene if you will: it’s the year 2000 and my family has embarked on a Christmas vacation to the Big Apple. Being from the UK, our winters are normally damp and full of rain. Coming to the sub-zero temperatures of a New York December meant pounding the sidewalks was a real task. New York seemed like a metropolis compared to life in buttoned-down Winchester. Standing under the bright neon advertisements in Time Square, I felt like the luckiest kid in the world. Keen to make the most of our trip, whilst sheltering from the cold in Macy’s, my Dad suggested the possibility of heading to the Garden to see the New York Rangers. At this point in time hockey was a completely foreign subject to me and part of me then secretly wished he had gotten Knicks tickets instead! I had no idea what to expect from this game- Hockey to me was played during P.E on AstroTurf with big wooden sticks and a tennis ball. However, this was to be an evening to remember and as I ascended the stairs into ‘The Garden’ I remember being struck at how big and impressive it all seemed.-Then again compared to being boxed into my football team Southampton FC’s tiny old ground ‘The Dell’, anything else seemed out of this world. Seeing the Rangers enter ice wearing their distinctive blue uniforms, I couldn’t argue they looked the part. 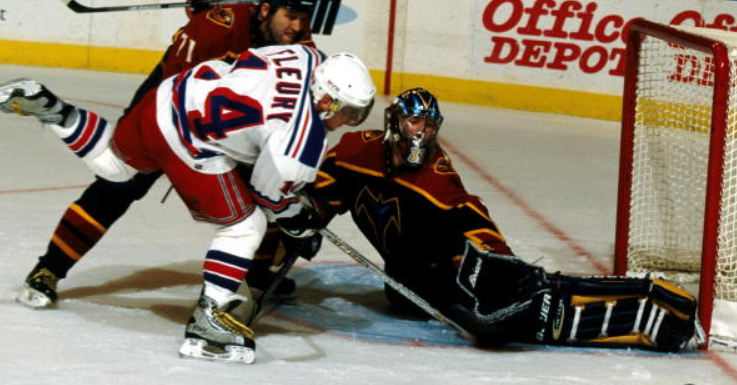 The Rangers then still had many of their 94 Stanley Cup winning team still active, such as captain Mark Messier, Adam Graves, Mike Richter and Mr Consistent Brian Leetch, as well as Theoren Fleury, being his old fiery self and Petr Nedved bolstering the attacking ranks. Their form coming into this game had been inconsistent. December had only brought three wins and a tie against LA. It was becoming obvious to the Rangers fans that this might be another year where the playoffs were missed by the Broadway Blue. At one point the jumbotron showed a segment about what the players wanted for Christmas. “HOW ABOUT WINNIN’ A FEW GAMES FOR A CHANGE!” one Rangers supporter yelled with gusto. The murmurs around suggested these fans weren’t here for the popcorn. Coach Ron Low clearly wasn’t winning many friends in New York. My memories of the game are hazy but I remember the scoring line going 4-1 in favour of Atlanta with the Rangers goal coming with seconds left in the third period. Mike Richter made a horrendous mistake in net that led to the third Atlanta goal. I also remember an in-depth conversation with a Rangers fan about how England had blown the chance to host the 2006 World Cup. Seeing that I was yet another naive tourist gracing NYC, the fans were kind enough to explain to me the rules. Apparently, there were not 4 quarters but 3 periods in hockey and yes, they did have the offside rule. While rough around the edges, the New Yorkers made me feel at home. The scoring summary reads that the Thrashers goals were scored by Steve Staios, Ray Ferraro, Yves Sarault and Donald Audette. Fleury got the lone Rangers goal which gave us at least something out of the whole experience. On the team-sheet, it also states that I saw notorious bust Patrik Stefan played for Atlanta (well, that’s not a fact to brag about!). The thing that stays in my mind most of all that stands out in my mind – the excitement all around when any fights broke out! We are taught as children that fighting is barbaric and to participate is wrong on all counts! Here there was no evidence of that as men, women and child rose to their feet and greeted each punch with screaming enthusiasm. Being English, this whole culture was alien to me- but I absolutely loved it! As I walked past a series of disgruntled Rangers fans to the subway afterwards, I had no idea just how significant this game would be in my future!